BAMAKO, Jun 12 2012 (IPS) - Tuareg and Islamist rebel groups which seized control of northern Mali in March are trying to find common ground for the joint administration of the territory. Residents of the region fear that individual and collective freedoms will not be respected if such an alliance sets up an Islamic state. Ansar Dine, which is linked to Al-Qaeda in the Islamic Magreb, and the National Movement for the Liberation of Azawad (MNLA) captured the northern part of this West African country in the power vacuum following a March coup. Abdoul Maïga, director of the Ahmed Baba Centre for Islamic Studies in Timbuktu, one of the main cities under rebel control, says the two groups have widely differing outlooks. “The MNLA wants to be closer to Europe where it has contacts. In contrast, Ansar Dine is oriented towards the Arab world where it has found support. I don’t know if this support comes from governments or from specific groups, but it’s certain that Ansar Dine’s funding comes from the Middle East, particularly Qatar,” Maïga told IPS over the phone. An accord between the Islamists and the MNLA was announced on May 26, in which they agreed to merge their armed forces and create an Islamic state in the regions of Timbuktu, Gao and Kidal. But five days later, the Tuareg rebels backed out of the agreement, stating their preference for an independent, secular state. An estimated 90 percent of Malians are Muslim, according to the country’s High Islamic Council. The northern regions, and Timbuktu in particular, have played a historically important role in the spread of Islam throughout West Africa. “But people don’t understand what is going on now. Here, Islam has never expanded by means of jihad or any other form of violence,” said Maïga. Negotiations between the rebel factions over the application of shari’a, Islamic law, have continued into June. Some northern residents see the failure of the merger as proof that shari’a can’t be applied in this region, particularly in cities like Timbuktu, which must preserve their reputation of openness to continue to attract tourists. “The northerner is by nature a free thinker. Liberty is very important to him, and that’s why 90 percent of the population doesn’t want these people in charge,” Sado Diallo, mayor of Gao, told IPS. Ansar Dine has begun applying Islamic law in the city, including cutting off thieves’ hands and flogging smokers, according to the mayor – who at the same time lamented the increase of auto theft and other banditry. “Every day I receive SMS messages from people who complain about acts committed by militias,” Diallo said. Far to the south, in the Malian capital, Bamako, the transitional government says that whether or not the rebels merge is immaterial. Government spokesperson Hamadoun Touré told state radio that the priority for the authorities is to relieve the suffering of residents of the north. Outside Mali, the Economic Community of West African States (ECOWAS) and the African Union are both worried by the possibility of a well-armed Islamic state being established in the north. During a recent visit to France, the Beninois head of state, Boni Yayi, who is also currently president of the AU, raised the possibility of an intervention by an African military force in Mali, under the aegis of the United Nations. Mali’s three northern neighbours, Algeria, Niger and Mauritania, are also concerned. Following the unilateral declaration of independence of Azawad on Apr. 6, these countries, who in 2010 set up a joint committee to fight against terrorism and drugs smuggling in the region, met in the Mauritanian capital, Nouakchott, to support ECOWAS initiatives in Mali. 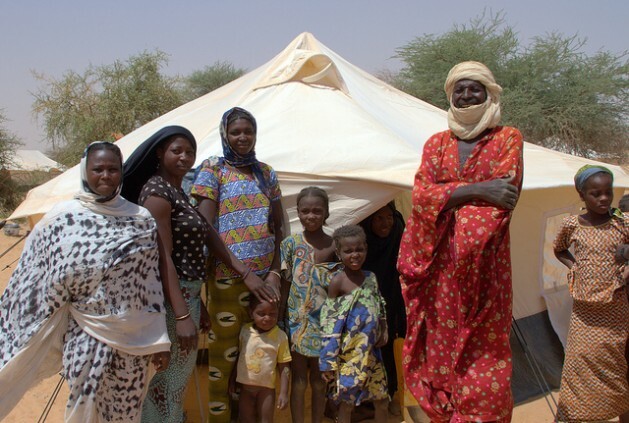 But while waiting for outside help, people in northern Mali have begun to lose patience. Seydou Cissé, a member of the Peul militia “Ganda Iso”, in the Gao region, told IPS that the population intends to fight. “All we want from the international community is support for the national army in the form of air strikes against Islamists who seized sophisticated weapons from Libya after the fall of Muammar Gaddafi,” he said. “We will do the rest to liberate our land,” he said.